Violet is asked to help opera singer Irma Fliech write a love letter following a performance. What initially looked to be a simple assignment proves to be much more difficult than Violet had imagined, when Irma rejects every letter that she writes. Looking through books for inspiration and even asking her friends, Violet finds herself at a dead end, despite realising that Irma is looking for lyrics to a song. However, after speaking with Irma’s assistant, Ardo, Violet learns that Irma is working on a modern play, hoping to push people into the future. While sharing with Irma her background as a soldier, Violet also discovers that Irma’s boyfriend, Hugo, had perished in the war. She later runs into Roland, who shows her love letters; realising that love is a feeling to be conveyed, Violet pours her heart out into her next composition. When she shows her work to Irma, Irma is moved to tears and accepts the lyrics for her song. 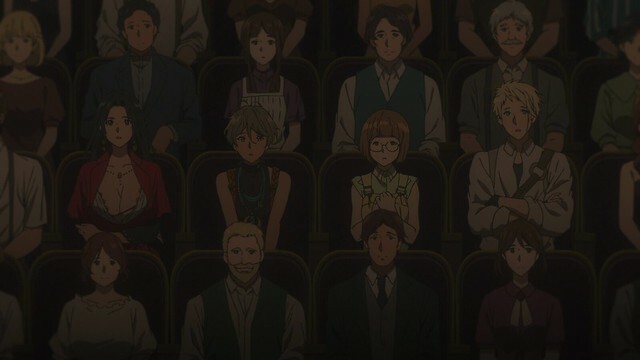 Violet and her friends watch Irma’s latest opera at the theatre, and when the performance concludes, Violet applauds with the audience, feeling that she’s come one step closer to understanding the meaning of aishiteru. 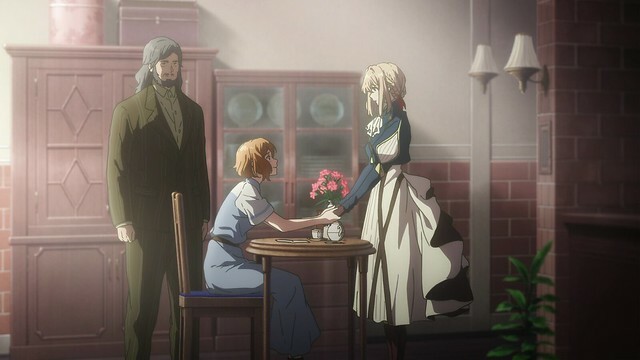 Set between episodes four and five, the Violet Evergarden OVA illustrates one more step in Violet’s journey towards learning Gilbert’s final words to her, using music as the medium to help convey what love is to Violet. Long considered to be the form of expression transcending linguistics and cultural barriers, music is a powerful means of conveying emotion, and its use in Violet Evergarden suggests that by being involved in writing lyrics, Violet also comes to really appreciate the power that letters and words can carry: we recall that Violet really began embracing her role as a Auto Memory Doll after helping coworker Iris with her own troubles, and this OVA presents a compelling story as to why. 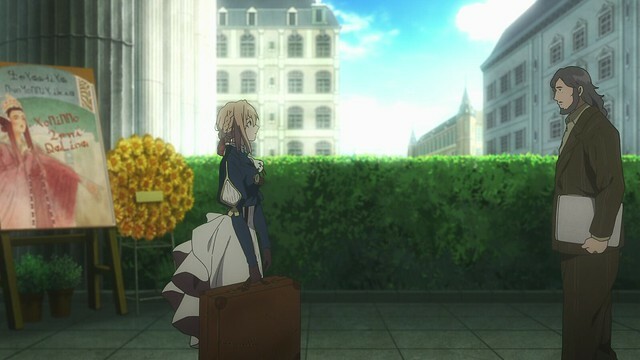 Through giving Violet a particularly difficult assignment, the Violet Evergarden OVA showcases Violet’s dedication and resourcefulness in completing her assignments. At this point, Violet is still very much a novice Auto Memory Doll, without the experience in capturing and expressing the clients’ emotions as quickly as would someone like Cattleya. When faced with Irma’s request, she begins by falling back on a concise, terse approach that she’d become familiar with in the military. Failing this, she consults various resources, in books and existing texts, to try and gain a better understanding of how to craft Irma’s letters. This is unsuccessful, so she accepts help from her coworkers, and gains a modicum of inspiration when learning Irma’s letter is really meant to be a song. This pragmatic approach, coupled with Violet’s eventual learning of Irma’s background and how the war had affected her, ultimately help to shape her ability to create a final product that meets Irma’s specifications. When she reads through the old letters with Roland, the sum of her experiences up until now give her the eureka moment, where she is able to finally understand how to best express Irma’s feelings in words. It was not any individual event, but the sum of the events, that allow Violet to succeed in her assignment. The same holds true in reality: while people may often think that success comes on a moment’s notice, through a stroke of inspiration, the truth is that behind the magic moment was hard work, commitment and dedication. Thus, when such a magic moment does materialise, one is able to recognise the pattern and then make the breakthrough. 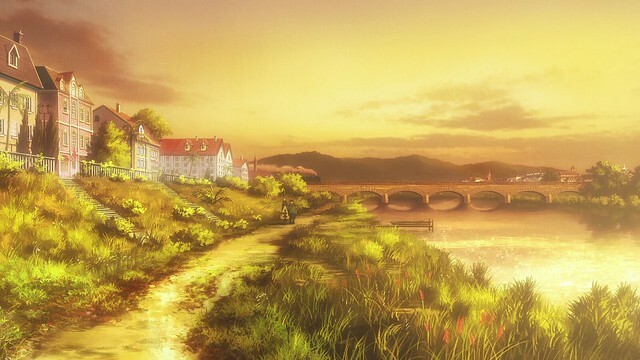 This is the theme that the Violet Evergarden OVA aims to convey – that eureka moments are the consequence of a substantial, honest effort. 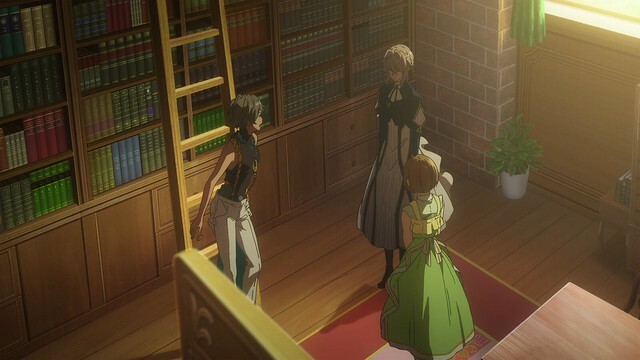 It’s been a while since I last wrote about Violet Evergarden, and one thing I noticed upon coming back into this series is the incredible detail in the visuals: from the clothing to interior shots, everything in this series is ornate, rich and above all, purposeful: while there may be a lot of stuff in a scene, none of it comes across as being clutter. Here, Violet meets with the opera singer and playwright Irma Fliech. 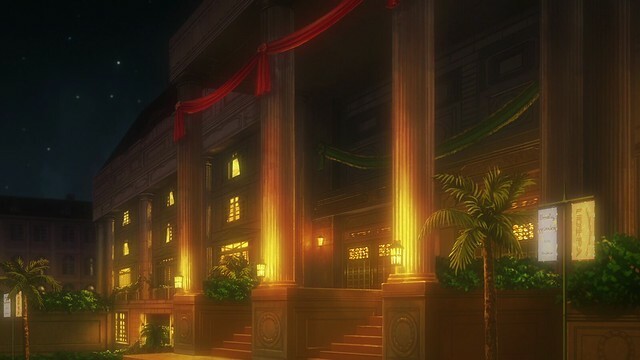 For this OVA post, I will be running with the standard of twenty screenshots. Violet’s task initially seems simple enough: write a letter that conveys feelings of love to a distant individual. 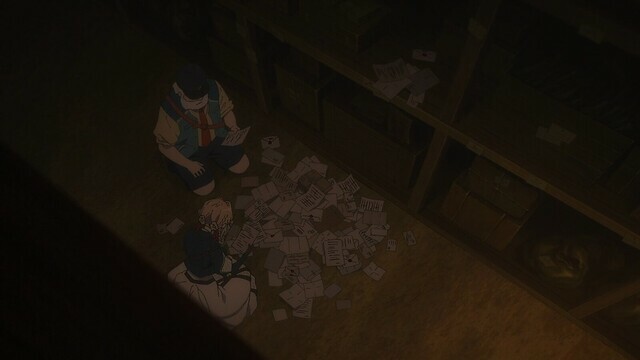 While Violet has slowly become more proficient in conveying emotions for others, her letter for Irma is much more challenging because Irma herself seems uncertain of what she’s looking for in the letter, only knowing that it’ll work when she sees it, and as such, Violet initially stumbles in her task. At the end of the day, however, it is the product for the customer, not the producer, that matters, and so, the mark of a good company is one which goes to great lengths in order to ensure that their customers are happy. Violet’s efforts and struggles show that she understands this; all too often, employees of some companies leave their customers in the dust and create PR disasters that tarnish a brand. I’m certain that many in the audience will be familiar with the feeling of a request or assignment that is insurmountable. Whether it be an assignment that seems to involve material beyond what was covered in a course, or the struggles of scope creep, challenges can often be overwhelming. However, the same is true of anything worth doing: I turn again to the classic example of the Apollo program and its aim of putting man on the moon. It would have been frustrating to watch as the Soviets made strides in their space program while American rockets failed, but over time, perseverance (and a serious commitment of funds) resulted in the world’s first successful moon landing. A natural reaction to adversity is the want to sink into the walls and disappear entirely. 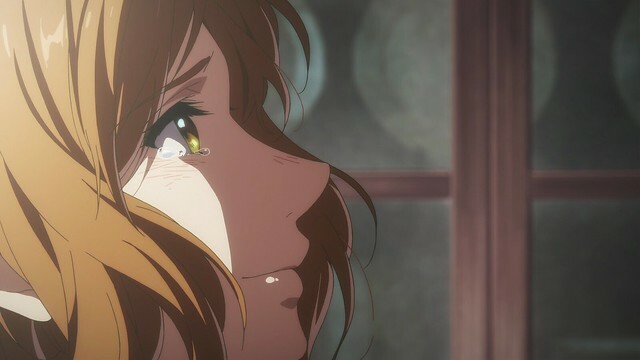 A part of the joy in Violet Evergarden was seeing such human reactions in the characters: Kyoto Animation is known for many things, but top in my books is their ability to capture human postures in a very fluid, life-like manner surpassing those of other studios. 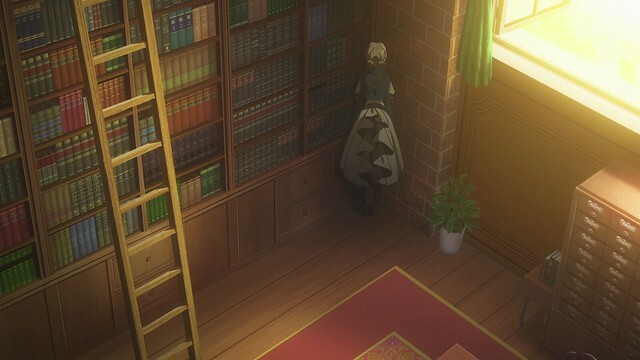 Even without words, Violet’s dejection is evident here, when she slumps against the bookshelf after coming up unsuccessful in finding inspiration. While Violet may have gotten off to a rough start with her coworkers with her terse, blunt mannerisms, her time with them leads to an increased degree of cordiality amongst one another, to the extent that Iris and Erica become concerned for Violet when she struggles with this task. Here, I remark that the Violet Evergarden OVA came out precisely a month ago, being bundled with the fourth BD volume. However, other commitments meant that I’ve not had a chance to watch the OVA until now. Even with this delay, I believe that this post remains the only comprehensive discussion on the Violet Evergarden OVA at this point in time. The first real bit of assistance comes when Violet encounters Ardo, Irma’s assistant, who shows her the format behind Irma’s request. It turns out that Irma intended for Violet to write the lyrics to a song, rather than a standard letter, and with this bit of information, Violet changes her approach. However, composing music is no easy feat; because music is such a powerful means of communication, getting everything right so it can convey a particular emotion or idea requires skill and a modicum of talent. Even with her coworkers assisting, writing lyrics for Irma’s song is quite difficult. The fact that music can transcend linguistic and cultural barriers is one of the reasons I enjoy listening to music of all languages: I have a large collection of Cantonese, Mandarin and Japanese songs that I frequently listen to. Even in the case of Cantonese music, my weak command of more poetic, formal Cantonese means that the meaning of most songs are lost on me: the only artist whose songs I understand without effort are those of Sam Hui’s. His music gained popularity precisely because common folk could understand the lyrics. By comparison, I have a very difficult time in discerning what is being said in the songs of other famous Cantopop artists (e.g. Alan Tam, Leslie Cheung, Danny Chan, Paula Tsui and Sally Yeh), although to be sure, I love 80s Cantopop. After Ardo explains Irma’s motivation for creating a contemporary play to tell a relatable and moving story to spur audiences to find a world beyond the war, Violet insistently follows Irma with the aim of trying to learn more about her. This simple action is both endearing and telling – the best way to understand what someone is seeking is to understand that individual, to empathise with them, and Violet’s persistence results in Irma yielding; she tells Violet of her own connection to the war after Violet explains that she was once a soldier who’d lost a loved one of her own during the conflict. As it turns out, Irma’s partner had been enlisted into the armed forces and despite his promise to come back to Irma, never did. The war’s consequences are very far-reaching, and a recurring theme in anime is that outside of politics, there are no winners when total wars are fought. This became the case when World War One was fought: advances in technology meant that slaughtering fellow humans could be done to the same scale as mass producing consumer goods. Much as how society has become increasingly sophisticated in our ways of communication, we have also devised increasingly lethal and devastating weapons to harm one another with. The whole of the OVA really is about the path Violet takes on a challenging assignment, and it shows that the way to a solution, seemingly straightforwards in hindsight, can sometimes be long and convoluted. Cracking a particularly difficult function can be like this: one can spend hours and days wondering why a call is not behaving as it should, and then encounter a solution out of the blue either when another pair of eyes is brought in or stroke of inspiration is found. 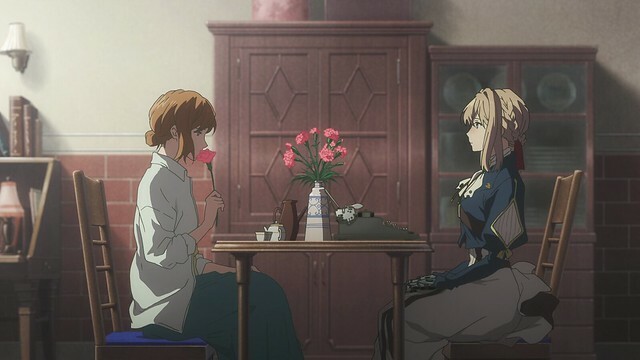 More so than any of the episodes, which come together to tell a story about discovering the meaning of love anew, the Violet Evergarden OVA is more about one of the snapshots in Violet’s journey towards becoming a capable Auto Memory Doll. I’ve heard that there are substantial differences between the light novel and the anime adaptation, with stronger human aspects in the anime, and a more prevalent military component in the light novels. 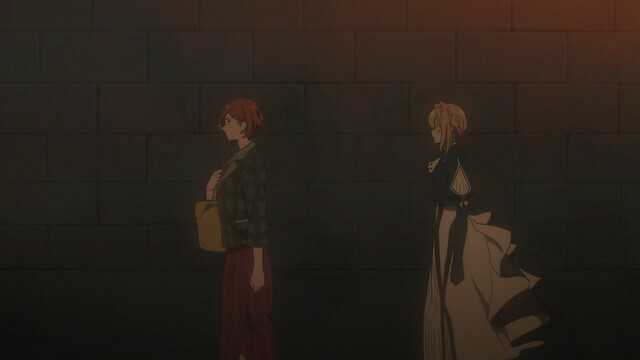 Given how Violet Evergarden‘s anime turned out, I am glad that the focus in the anime was about love and moving on without forgetting: the broader narrative of the light novels were distilled into a single cohesive message for the anime’s thirteen episode run. Looking back, I would tend to think that if there were more episodes, then additional stories from the light novels could have been adapted. While I am very happy with how Violet Evergarden turned out, it would have been interesting to see Violet wield Stormbreaker Witchcraft, a custom battleaxe that grown men cannot lift. With this being said, now that the war is over, there would not have been much of a context to incorporate it, so unless there is another conflict brewing, I do not think it is strictly necessary to show the weapon. 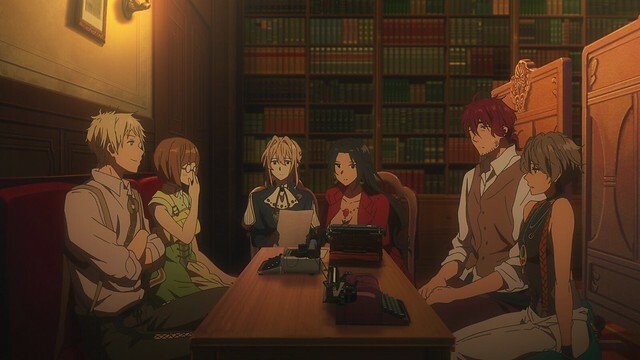 Having said this, there is a Violet Evergarden movie in the works, and while its precise contents are not known, it could give audiences a chance to see a side of the light novels not seen in the TV series. The true turning point in Violet’s assignment is when Roland brings her to a warehouse where they find letters that never made it to their intended recipient. See all of the motions carried within the words in each letter, coupled with listening to Irma recount how her own boyfriend never returned from the war, gives Violet the inspiration to really write her song. I got a very similar feeling from watching this scene as I did when the anthropologists found the bag of letters in Letters from Iwo Jima, and upon pouring the letters out, the voices of the soldiers resounded. Letters are meant to capture and convey emotions and experiences; in a sense, it’s transferring one’s feelings onto paper, and this romanticism is lost with modern technologies, such as email and instant messaging. Violet’s final submission unsurprisingly passes Irma’s requirements, and is powerful enough to move Irma to tears. 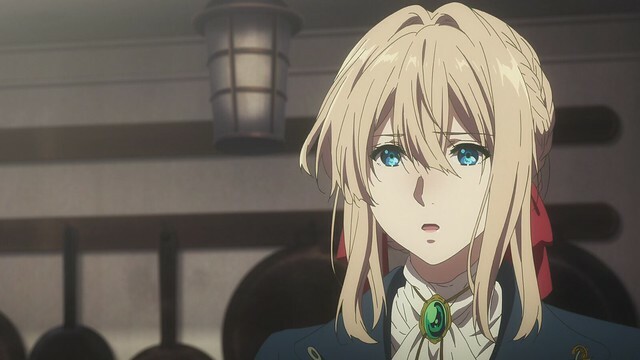 Far more than any series I’ve seen, Violet Evergarden is able to evoke strong feelings in audiences. 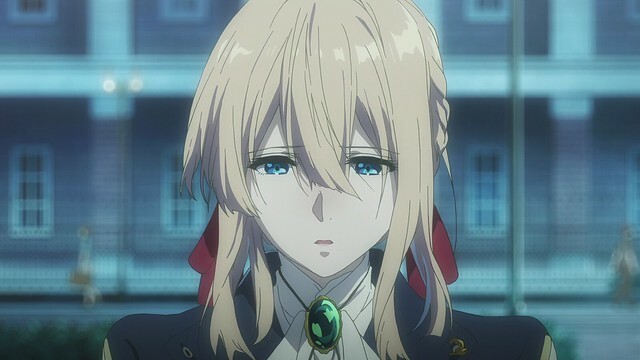 One of my criticisms in Violet Evergarden‘s original run was that most of Violet’s best moments stem from learning to understand sorrow, but looking back, Violet does undertake several assignments that see her grow in different ways, too. Completing difficult assignments are all the more rewarding, and despite (or because of) my upbringing, I’ve always longed to take on the things that are difficult precisely because they are difficult. However, for the most part, the rest of the world never sees the journey, only the outcome. As a result, I am very satisfied with the path that the Violet Evergarden OVA ended up taking. I’ve long been fond of OVAs that are set in-between the events of the main series, as they add a sense of depth to the characters beyond what we’ve seen in the main series proper. Traditionally, OVAs are usually bundled with home releases, but a new trend is that some of the longer OVAs are screened theatrically, akin to a smaller-scale movie: OVAs have always been a bit more difficult to watch, as they are not simulcasted on popular steaming platforms; like movies, some OVAs can take a considerable amount of time to become purchasable. Every year, I push two posts on this date. I believe last year, I wrote about use of setting in GochiUsa and discussed how Miho becomes Miporin. The year before, I wrote about Yūki Yūna is a Hero and Call of Duty 4: Modern Warfare. 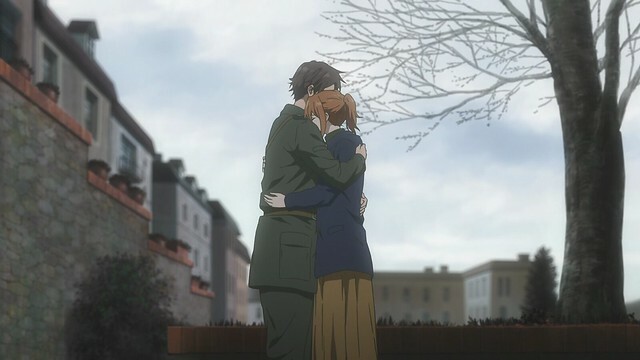 This year, I discuss Violet Evergarden‘s OVA and a wishlist of battles and theatres I’d like to see for Battlefield V. I tend to write these posts in advance and publish them both, rather than write them on the same day: this is the only reason why I was able to spend all of today out and about and still get the posts done. I ended up taking a rare Saturday to sleep in, get some things sorted out in the morning for my upcoming excursion, and spent the afternoon shopping. It’s been overcast and rainy all day, which was a welcome respite from the heat in the area, and as evening settled in, I sat down to my favourite dish at the local bistro: the All-American Hot Plate, which features pork chop, chicken steak, beef short rib, sausage, corn, fried egg on rice and fries. 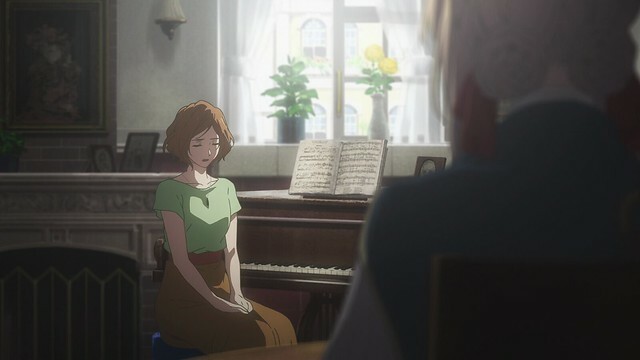 The song that Irma performs is LETTER, which is included in the Violet Evergarden vocal album, “Song Letters”. I’ve never been to an opera performance before, although in my time as a student, I’ve attended my share of live performances before. There’s a certain degree of magic and fun to watching a play compared to a movie: the performers on stage use all of their acting skills, the set and environment to convince their audience of an unreal reality. Lacking the editing trickery and special effects of films, the effectiveness of a stage play boils down entirely to the actors. 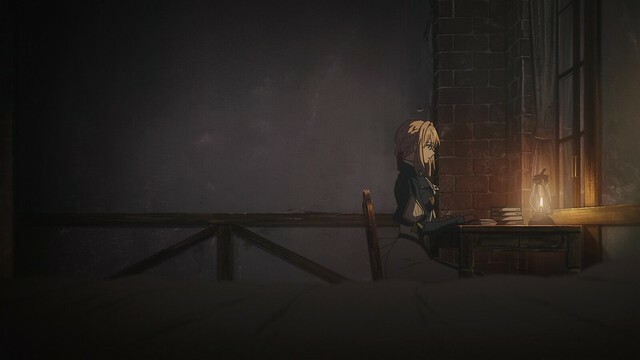 I believe that with this OVA in the books, Violet Evergarden really draws to a conclusion for now, at least until the film comes out in 2020. For the present, however, there is plenty of other anime films and OVAs on the table that merit a look: I definitely have plans to write about Flavours of Youth (Shikioriori), which came out earlier today, and Non Non Biyori Vacation will première later this month, along with I want to eat your placenta (no joke, that’s the real title) and Penguin Highway. Sayonara no Asa ni Yakusoku no Hana o Kazarō (Maquia: When the Promised Flower Blooms), a PA Works film that released earlier this year, will be getting a BD release in less than three months, as well. There is no shortage of things to do in the interim, and one of the challenge I stare down will simply be to find time to enjoy all of these films and write about them on top of the other things that I do. 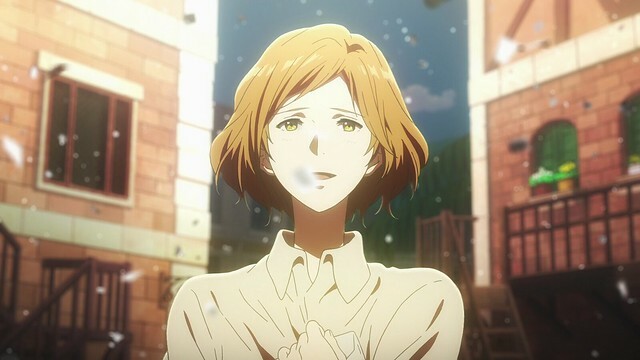 The Violet Evergarden OVA is a very powerful and well-written addition to the series – despite being a standalone story with a clear message, it fits in very well with the anime’s main narrative, showing one of the moments that allows Violet to grow and discover. Because Violet’s prowess as an Auto Memory Doll grows quite quickly in the anime, seeing her stumble, and get back up in the face of a difficult task shows that her improvement comes not from her existing skills alone, but also from her own determination and attitude. Seeing this OVA thus gives audience a chance to see an instance where Violet uses a variety of means to complete her task: she naturally grows into her role as an Auto Memory Doll over time. 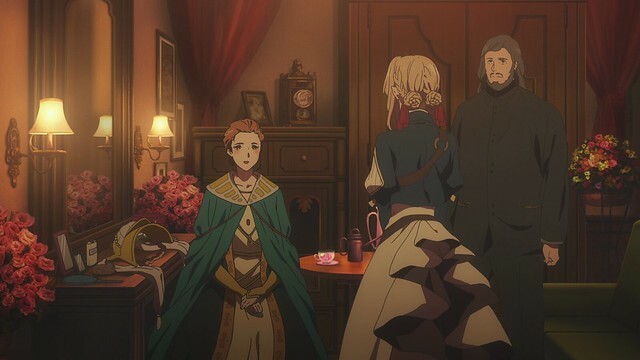 This accentuates the human elements of Violet Evergarden, which were finely presented during the televised run back in the winter season. At this point in time, the series has reached a conclusion, but there is word of a film that will release in 2020. 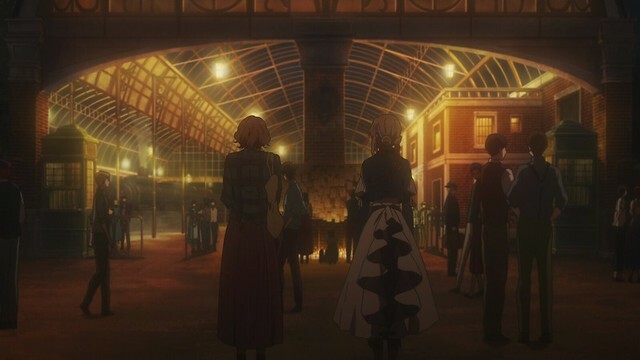 Its precise contents are unknown, and speculation remains quite open because the anime ended on a very definitive note – what the movie entails is anyone’s guess, but the one commonality is the hope that the upcoming Violet Evergarden movie will not be a compilation film.